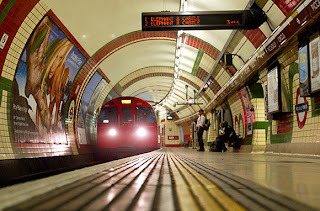 The Most Impressive Subways EVER! Granted it's hard to beat NYC. As Wired pointed out awhile back: "It's got 468 stations, 842 miles of track and twice as many daily riders (5 million) as every other rapid-transit system in the United States combined." That said, Hong Kong, Shanghai, Paris, & London are all pretty darn impressive. Check them, and several others, out here. And as good as these subways are, Crooked Brains has a post on Subway Stations that could be even better. Check it out! 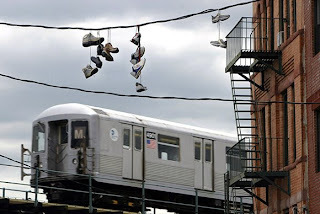 Back in June, I posted an idea (or rather two) on how to improve the NYC Subways. I still haven't found the MTA suggestion box, but I do have a NYC Subway Improvement Idea for July. This time it's just a borrowed idea from my travels. Why can't we have LED signs that let expectant passengers know when the next train is expected to arrive? Was it London that I saw them in? Vienna? Or just all of Europe? And where can I find a photo of this sign so the blog can look all nice & pretty? 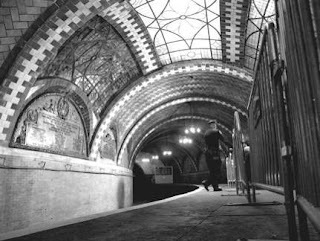 We have been anticipating our trip to the abandoned City Hall subway station for a couple of months now. We are going today! There's a nice write up on the stop at Forgotten NY. Can't wait! 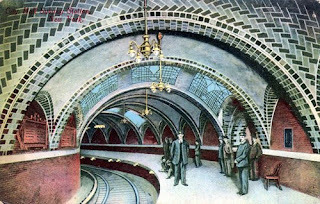 You have to join the Subway Museum to go. You'd think people would recognize that when there is a swarm of people coming up the subway stairs, it means that a train has recently arrived. Which also usually means that same train has left the station, so there is no reason for them to go down the stairs until everyone else has exited. But the people don't seem to realize this and it just isn't going to happen. I have a few ideas on this subject (being the subway problem not the realization one), but a simple (and inexpensive) solution would probably be to just paint a yellow line down the center of the stairs. People would presumably get it that one side is for up and one side is for down. If they need some help, an arrow could be painted on each side to indicate up or down. If they need further help, arrows could be painted on the corresponding wall. I recognize that this is not the most efficient use of the stairs as all the space is not being used for the most pressing need (i.e. for going up on exiting, or down when a train is arriving), and I have a few good ideas on how that could be better done too.